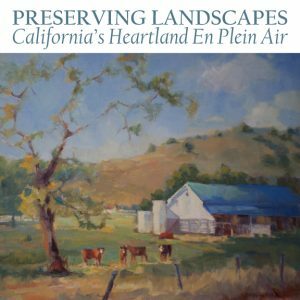 Preserving Landscapes is an exhibition of paintings produced on location at a number of the properties associated with Sequoia Riverlands Trust, a regional, nonprofit land trust which works to conserve the natural and agricultural legacy of this part of California. This show features a dozen paintings made on location on SRT properties, many by members of the California Art Club, a longstanding and well-respected artists organization headquartered in Southern California. The works reflect the inspirational beauty inherent in our Tulare County agricultural lands. Donated to Sequoia Riverlands Trust by the individual artists, the paintings are available for purchase with proceeds supporting SRT’s programs. Included in the exhibition are paintings by Tulare Country artists Paul Buxman and Ernie Weerasinghe, as well as works by California Art Club members Don Crocker, Sherill Miller, Clark Mitchell, Jean Osher and Sarah Vedder. The exhibition will be on display at Arts Visalia January 3rd through January 31st, 2014 with an opening reception to be held on Friday, January 3rd from 6:00 to 8:00 p.m. Admission is free and open to the public. Gallery hours are Wednesday through Saturday from Noon to 5:30.